The French Program at OJCS follows a Communicative/ Experiential approach. This approach takes into account the context in which the language is used for communication, both oral and written. The program is designed to have the student develop language and communicative skills by doing things rather than by simply examining the language. The students no longer begin by studying the code system in order to understand its functioning. Instead, they find themselves in a situation where they must use the language for a definite purpose, to complete a clearly defined task, much like the principle of immersion. To successfully complete a specific task, the students need to know certain language elements such as grammar rules, verbs, and sentence structure. 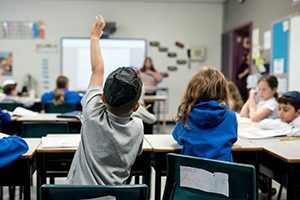 In this approach, we look at the socio-cultural context of the French language in order to prepare them to live in Canadian Society and to broaden their cultural horizons. This includes French Canadian culture in Québec, the French Acadian culture in Atlantic Canada, the culture of pockets of French speakers in other provinces such as Saskatchewan and the culture of francophone nations throughout the world. 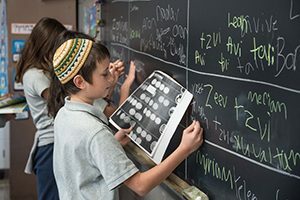 This approach also focuses on how languages are learned, the strategies used and makes language comparisons such as French words that are the same as English words, the use of masculine/feminine in comparison to the Hebrew language just to name a few. 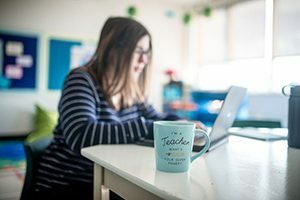 Our French teachers from kindergarten to grade eight work very hard to ensure that our students receive an excellent French program that exceeds Ontario Ministry curriculum standards. In grades four and five, the Extended French students study Social Studies in French for two periods a week. In Grades six to eight they have three periods of Social Studies taught in French. In Grade Four, the program is streamed so that students can begin to work at their respective levels; we differentiate between Core French (French) and Extended French (Français). The students are selected based on their performance in Grade Three French, and a short assessment dialogue with the French Faculty. 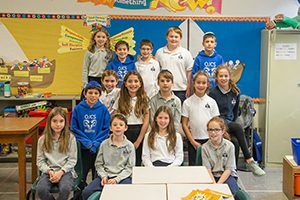 It is important to note that at OJCS, we offer 20% more French per week to the Core French students than the Ottawa Public Board Core French students. Our Extended French program is similar to the Ottawa Public Board in that we also teach a second core subject in French, Social Studies. We are proud of our graduates who go on and excel in any program requiring the use of French in secondary or post-secondary language settings. Many of our students successfully transition to immersion contexts in high school. Every year, we celebrate French day and our kindergarten to grade three French classes present the AIM plays and the French department put together a great French assembly which showcases the talents of all our students. Whether it is a song, a skit, a poem, or a story, their love of the French language is clear. STEM stands for Science, Technology, Engineering and Math and are core subjects that build innovators. STEM curriculum uses a hands-on, problem-based approach to learning that develops critical thinking skills and facilitates innovation. Real-world situations that students can relate to are the basis of STEM curriculum and then encourages a more engaged and interactive learning atmosphere. We are incorporating STEM into many of our classrooms through activities such as building bridges out of pasta in science class to constructing mini Sukkahs that are both kosher and to scale in Judaics class. Since expanding our music program all students from Kindergarten to Grade 8 receive one period of music class a week. Students from Kindergarten to Grade 4 explore different elements of music through playing the recorder, singing and listening. The curriculum also includes music history, rhythms, different instruments and the orchestra. Music literacy (notation) is introduced after kindergarten to prepare students for the transition to Grade 5. Our school walls and classrooms are brought to life with murals, sculptures and paintings created by our young artists. Students in Grades 1 to 8 are taught visual arts one period a week in our colourful and eye-catching art room. Following the Ontario curriculum, each month focuses on a different theme or art medium and introduces artists who specialize in that medium. 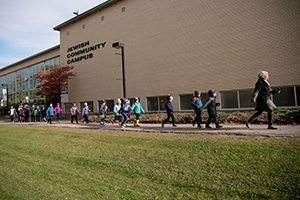 Consistent from year-to-year in the art curriculum are three major subjects: Aboriginal and Canadian Art, Art History and Jewish Art. At OJCS every student has scheduled library time during the week. When spending time at the library youngsters hear stories read-aloud — picture books, fairy tales, stories by Jewish authors, and others — and choose books from our English, French, and Hebrew collections to take home and enjoy. For them, the library is a place to discover their favourite characters, from the first characters that touch their hearts. Thanks to an upgrade in the summer of 2018, the OJCS library is now run by state-of-the art online software. Along with on-location upgrades, such as self-serve checkout and a much improved search and discover function, our software allows student to interact with the library online- reserving books, creating reading lists, writing their own book reviews and so much more – all from any computer, phone, tablet…virtually anywhere! Technological resources are always available to the students as well. Desktop and laptop workstations, printers and presentation stations are all part of the inviting environment at the school library for our students and families at OJCS.